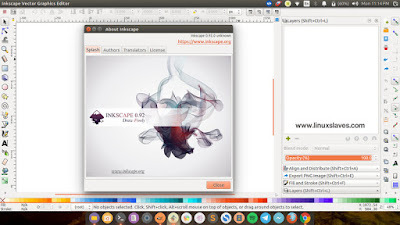 Install Inkscape 0.92 in Ubuntu, Linux Mint, Elementary, and derivatives - Inkscape is a professional free vector graphics editor alternative to corel draw for Linux, Mac OS X and Windows. More than free, Inkscape open source software. Whether you are an illustrator, designer, web designer or just someone who needs to create some vector image. Finally, the Inkscape project announces a new version 0.92 of its popular vector drawing software with many new features and changes including mesh gradients, improved SVG2 and CSS3 support, new path effects, interactive smoothing for the pencil tool, a new object dialog for directly managing all drawing elements, and many more. The screenshot above is how the latest Inkscape in my Ubuntu 16.04 LTS looks like. The default resolution was changed from 90dpi to 96dpi, to match the CSS standard. Inkscape 0.92 will attempt to identify 'legacy' Inkscape files that need to be converted. Please head to Inkscape 0.92 release notes for full list of changes and more details. Inkscape is pre-packaged for most of the widely used free GNU/Linux distributions. So your package manager / app store should be able to find Inkscape in one line. Inkscape Board member Ted Gould has made Inkscape 0.92 available as a snap package. Snaps are a distribution-independent way of installing software on Linux. If you have an old version of Inkscape already installed via package management, that version may still have priority in your path. To solve this problem, you can either uninstall the old version, change the priority of /snap/bin/ and /var/lib/snapd/desktop/applications/ in your path, or run the snap of Inkscape with the command /snap/bin/inkscape. 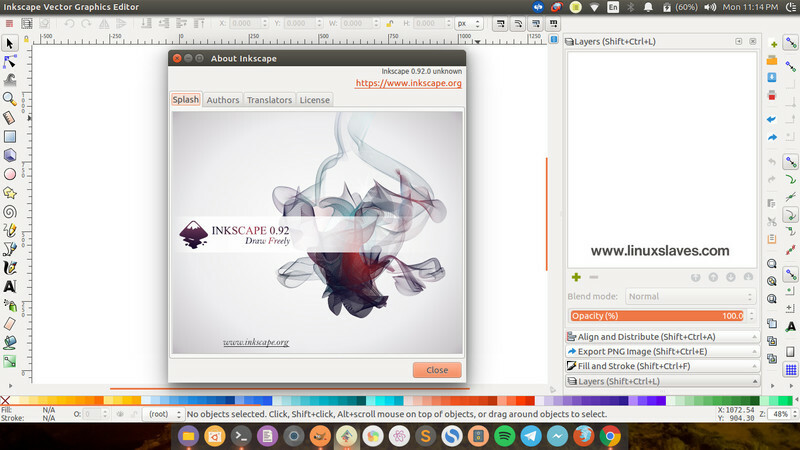 Inkscape 0.92 is available in its Stable official PPA repository for Ubuntu 14.04 LTS Trusty Tahr, 16.04 LTS Xenial Xerus, 16.10 Yakkety Yak, 17.04 Zesty Zapus and its variants. Alternatively, you can open Software Updater utility and click install the updates. Cheersss, enjoy draw freely with Inkscape 0.92! These were all how to install latest version of Inkscape 0.92 in Linux : Ubuntu, and derivatives system like Linux Mint and Elementary OS. Thanks for visiting us!